NCERT Textbook Solutions are considered extremely helpful when preparing for your CBSE Class 9 Mathematics exams. TopperLearning study resources infuse profound knowledge, and our Textbook Solutions compiled by our subject experts are no different. 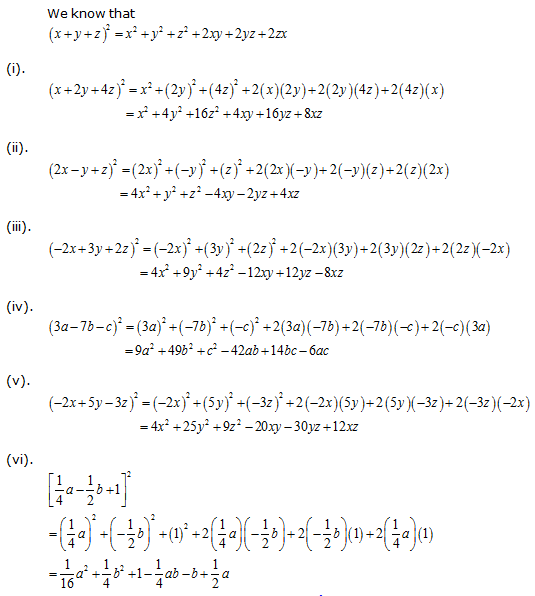 Here you will find all the answers to the NCERT textbook questions of Chapter 2 - Polynomials. All our solutions for Chapter 2 - Polynomials are prepared considering the latest CBSE syllabus, and they are amended from time to time. Our free NCERT Textbook Solutions for CBSE Class 9 Mathematics will strengthen your fundamentals in this chapter and can help you to score more marks in the examination. Refer to our Textbook Solutions any time, while doing your homework or while preparing for the exam. Yes, this expression is a polynomial in one variable x. Yes, this expression is a polynomial in one variable y. No, here the exponent of variable t in term which is not a whole number. So this expression is not a polynomial. No, here the exponent of variable t in term is -1, which is not a whole number. So this expression is not a polynomial. No, this expression is a polynomial in 3 variables x, y and t.
Concept Insight: In such problems to check whether the given algebraic expressions is a polynomial or not, check the exponents of variable to be a whole number. The second step is to look for the number of variables the expression has. Any alphabet used in the expression is the variable unless specified as constant. (i) In the above expression coefficient of x2 is 1 (ii) In the above expression coefficient of x2 is - 1. (iii) In the above expression coefficient of (iv) In the above expression coefficient of x2 is 0. Concept Insight: The constant/ variable multiplied with the variable is the coefficient of the variable. Also consider the sign (+ve or the -ve) of the term while writing the coefficient. Degree of a polynomial is the highest power of variable in the polynomial.Binomial has two terms in it. So binomial of degree 35 can be written as x35 + 7 . Monomial has only one term in it. So monomial of degree 100 can be written as 7x100. Concept Insight: Mono, bi and tri means one, two and three respectively. So, monomial is a polynomial having one term similarly for binomials and trinomials. Degree is the highest exponent of variable. The answer is not unique in such problems . Remember that the terms are always separated by +ve or -ve sign and not with . Degree of a polynomial is the highest power of variable in the polynomial. This is a polynomial in variable x and highest power of variable x is 3. So, degree of this polynomial is 3 This is a polynomial in variable y and the highest power of variable y is 2. So degree of this polynomial is 2. This is a polynomial in variable t and the highest power of variable t is 1. So degree of this polynomial is 1. (iv) 3 This is a constant polynomial. Degree of a constant polynomial is always 0. Concept Insight: Degree is the highest exponent of the variable. While finding the degree of a polynomial express the polynomial in standard form Combine the like terms and Remember the result that xo = 1. (i) 2 + x2 + x is a quadratic polynomial as its degree is 2. (ii) x - x3 is a cubic polynomial as its degree is 3. (iii) y + y2 + 4 is a quadratic polynomial as its degree is 2. (iv) 1 + x is a linear polynomial as its degree is 1. (v) 3t is a linear polynomial as its degree is 1. (vi) r2 is a quadratic polynomial as its degree is 2. (vii) 7x3 is a cubic polynomial as its degree is 3. Concept Insight: Linear polynomial, quadratic polynomial and cubic polynomial has its degrees as 1, 2, and 3 respectively. Concept Insight: Given Polynomial is p(x) to find the value of given polynomial at any particular value of x replace the variable x with its corresponding value. Remember for odd power of negative number the negative sign remains while for even power of negative numbers the negative sign vanishes. Also check for calculation errors; there are chances of making calculation mistake while computing square, cubes and higher powers of numbers. p(2) = (2 - 1 ) (2 + 1) = 1(3) = 3 Concept Insight: Replace the variable with 0, 1 or 2 in the given polynomials to obtain the required value. Be careful about the calculations, there are chances of making calculation mistake while computing square, cubes and higher powers of numbers. Carefully apply the properties of addition, subtraction and multiplication of numbers. While multiplying two binomials multiply each term of the binomial to each term of the other binomial. Hence x = 1 and - 1 are zeroes of polynomial. (iv) If x = - 1 and x = 2 are zeroes of polynomial p(x) = (x +1) (x - 2), then p(- 1) and p(2)should be 0. So, x = - 1 and x = 2 are zeroes of given polynomial. (v) If x = 0 is a zero of polynomial p(x) = x2 then p(0) should be zero. Hence x = 0 is a zero of given polynomial (vi) If is a zero of polynomial p(x) = lx + m, then is 0. (vii) If and are zeroes of polynomial p(x) = 3x2 - 1, then Hence, is a zero of given polynomial but is not a zero of given polynomial. (viii) If is a zero of polynomial p(x) = 2x + 1 then should be 0. So, is not a zero of polynomial. Concept Insight: Key idea here is Zero of the polynomial is not the real number zero but it is that value of the variable which makes the value of the polynomial equal to zero. A polynomial can have more than one zeroes. Zero of a polynomial is that value of variable at which value of polynomial comes to 0. So, for , value of polynomial is 0. Hence is a zero of polynomial. Concept Insight: Equate the polynomial to zero and solve the corresponding linear equation to get the value of variable. Be careful while transposing the terms to the other side. For verification substitute the value of the variable obtained in the polynomial. Zero of x +1 is-1. Zero of x is 0.
i.e. x = - OR (i) x + 1 By long division So, remainder is 0. (ii). By long division So the remainder is - . Concept Insight: The remainder of any polynomial p(x) when divided by another polynomial (ax+b) where a and b are real numbers is p(-b/a). Note that here -b/a is the zero of polynomial ax+b. Dividend = Quotient Divisor + Remainder can be used. According to the remainder theorem, if p(x) is any polynomial of degree 1 and a is any real number, then when p(x) is divided by the linear polynomial x - a, then the remainder is p(a). Note that here -b/a is the zero of polynomial ax+ b. This question can also be solved using long division method however it is long and time consuming. Chances of making computational error are high in that method. Here p(x) = 3x3 + 7x 7 + 3x is not a factor of 3x3 + 7x. OR Let us divide (3x3 + 7x) by (7 + 3x). If remainder comes out to be 0 then 7 + 3x will be a factor of 3x3 + 7x. By long division As remainder is not zero so 7 + 3x is not a factor of 3x3 + 7x. Concept Insight: Any linear polynomial 'ax+b' where a and b are real numbers is a factor of the polynomial p(x) iff p(-b/a) = 0 i.e -b/a is a zero of p(x) or both the polynomials has a common zero -b/a. This question can also be solved using long division method. Do not forget to change the sign of terms while subtraction in the long division. (i) If (x + 1) is a factor of p(x) = x3 + x2 + x + 1, p (- 1) must be zero. Hence, x + 1 is a factor of this polynomial (ii) If (x + 1) is a factor of p(x) = x4 + x3 + x2 + x + 1, p (- 1) must be zero. As, So, x + 1 is not a factor of this polynomial (iii) If (x + 1) is a factor of polynomial p(x) = x4 + 3x3 + 3x2 + x + 1, p(- 1) must be 0.
p(x) = , p(- 1) must be 0. So, (x + 1) is not a factor of this polynomial. Concept Insight: A linear polynomial 'x-a' is a factor of the polynomial p(x) iff p(a) = 0. Note that 'a' is a zero of polynomials x-a and p(x) . Be careful while squaring and cubing the numbers. Hence, g(x) = x + 1 is a factor of given polynomial. (ii) If g(x) = x + 2 is a factor of given polynomial p(x), p(- 2) must be 0. Hence g(x) = x + 2 is not a factor of given polynomial. (iii) If g(x) = x - 3 is a factor of given polynomial p(x), p(3) must be 0. So, g(x) = x - 3 is a factor of given polynomial. Concept Insight: The problem is a direct application of Factor theorem. g(x) will be the factor of the polynomial p(x) iff the zero of the linear polynomial g(x) when put in place of the variable of polynomial results to zero. Be careful while squaring and cubing the numbers. So, value of k is - 2. Concept Insight: x-1 is a factor of the given polynomial p(x) iff p(1) = 0 thus equating p(1) to zero will give the required value of constant k. Be careful with arithmetic simplifications. The two numbers such that pq = 2 3 = 6 and p + q = 7. The two numbers such that pq = - 36 and p + q = 5. The two numbers such that pq = 3 (- 4) = - 12 and p + q = - 1. They are p = - 4 and q = 3.
b is expressed as the sum of two numbers whose product is ac. Do not forget to consider the sign of the terms while splitting. Factors of 2 are � 1, � 2. Factors of 5 are �1, � 5. Concept Insight: To factorise p(x) when its degree is greater than or equal to 3 note down all the factors of constant term considering both negative and positive sign. Check the obtained factors for the possible zeroes of the polynomial p(x) Using Factor theorem one zero can be obtained continue the process till all the zeroes are obtained or use long division method. To obtain the other quadratic factor use long division to determine the other factors. The degree of the polynomial is less than or equal to the number of real factors the polynomial. (v). By using identity Concept Insight: If the value of the two terms of the binomials are equal then use the algebraic identity (x+a) (x-a) = x2 - a2 else use (x+a) (x+b) = x2+(a+b)x+ab to obtain required product. = 9984 Concept Insight: The key is to use the algebraic identity (x+a) (x+b) = x2+(a+b)x+ab or (x+a) (x-a) = x2 - a2 for such questions. Write each of the numeral as 100 � k , or any other suitable number whose square can be easily computed. Concept Insight: Use the appropriate square identity. If the polynomial has only two terms, reduce each term to the perfect square and use the algebraic identity . When the polynomial has three terms and the term having unit power of each variable has negative sign use the square identity else use . Concept Insight: Use the algebraic identity . Do consider the sign of terms while multiplying and squaring. Concept Insight: Use the algebraic identity in the reverse order. Write each term as per the terms of the standard identity. Do consider the sign of terms involved. Concept Insight: Since the expressions involves cube so cubic identity will be used. If the terms of the given polynomial are separated by positive sign use the identity or if negative signs are used then use . Carefully apply the mathematical operations. = 994011992 Concept Insight: Use the cubic identity and . Write the numerical term as something added or subtracted from 10,100, 1000 or higher powers of 10 as it's easy to compute higher powers of 10. Carefully apply the mathematical operations. Concept Insight: Since all the polynomial given here have degree 3 so cubic identities would be used here. Now if all the terms of the given polynomial are positive then use identity while if any two terms has negative sign reduce each of the term of the polynomial as per the standard cubic identity . Concept Insight: When the two terms of the polynomial are separated by positive sign use the identity and when by negative sign use . Carefully take the common term out. Concept Insight: Reduce the terms of the polynomial to perfect cube and then if the two terms of the polynomial are separated by positive sign use the identity and when by negative sign use . We Know that Concept Insight: Reduce each terms of the polynomial as per the left hand side of the standard identity, . We know that Concept Insight: Since the left hand side of the identity resembles the left hand side of identity, , so this identity will be applicable here. Now the right hand side of the above identity can be written into many forms we need to look at what is required to proved, Accordingly apply mathematical simplifications and square identities to get the desired result. Concept Insight: Use the result that for x + y + z = 0. Concept Insight: Use the result since x + y + z = 0. Also consider the sign of the term. Carefully do the computation. Area = length breadth Concept Insight: For such questions factorise the expression, given for the area of rectangle by splitting the middle term. One of its factors will be its length and the other will be its breadth. Volume of cuboid = length breadth height (i). Length = 3, breadth = x, height = x - 4 Concept Insight: For such questions factorise the expression, given for the volume of the cuboid by taking the common term out if it has two terms and by splitting the middle term if the polynomial has three terms. Three factors obtained will be its length breadth and height. TopperLearning provides step-by-step solutions for each question in each chapter in the NCERT textbook. Access Chapter 2 - Polynomials here for free.